We know we’ve probably been slightly self obsessed , but we believe nothing sells our product better than reviews and success stories from happy customers . Without further ado , Storewoot presents A big thank you , part three . ( Yes , this part is the last , we promise ) . 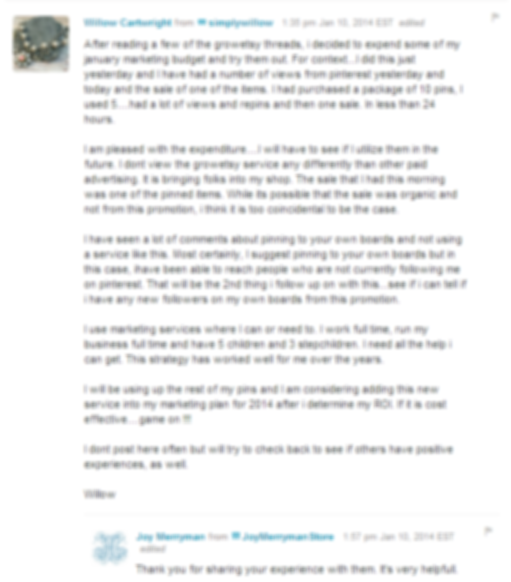 Teresa started off with the free trial , and got views and likes that were satisfactory . She quickly understood that selling your best product is THE way to ensure continued traffic . With a budget of 15 $ , she promoted three products over a time period of 28 days , and saw that the results were more than satisfactory , with her products getting at least 90 extra visitors . We’re happy you’re happy , Teresa ! 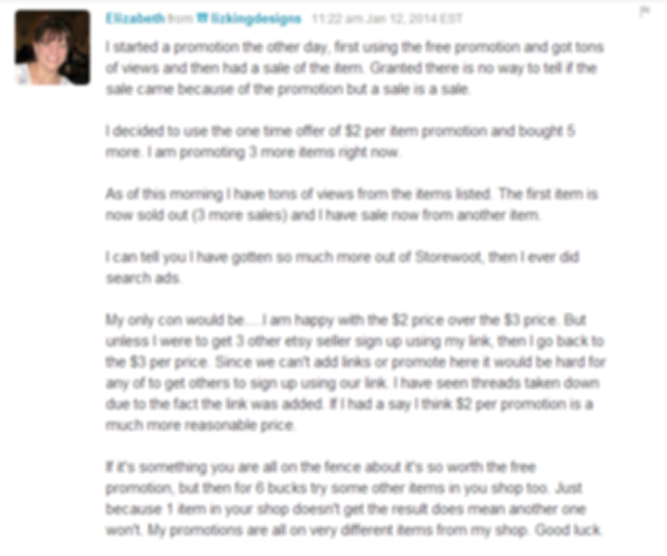 Elizabeth has been one of our earliest customers , and has found her success pretty quickly through Storewoot . 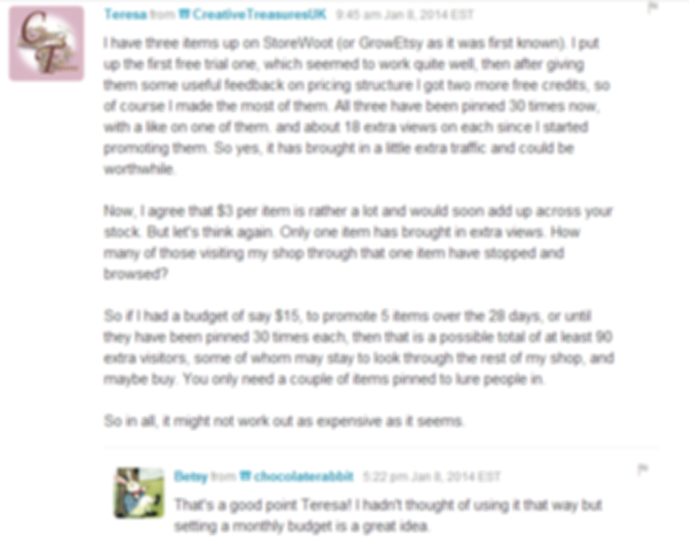 She started off with the free promotions and then quickly moved on to the paid versions , and we’re happy to tell you that she got out of Storewoot much more than she could ever get out of paid advertising . Donna Colon from PixieWineCharms . Donna signing up for Storewoot turned out to be accidental , but an accident she is happy about . 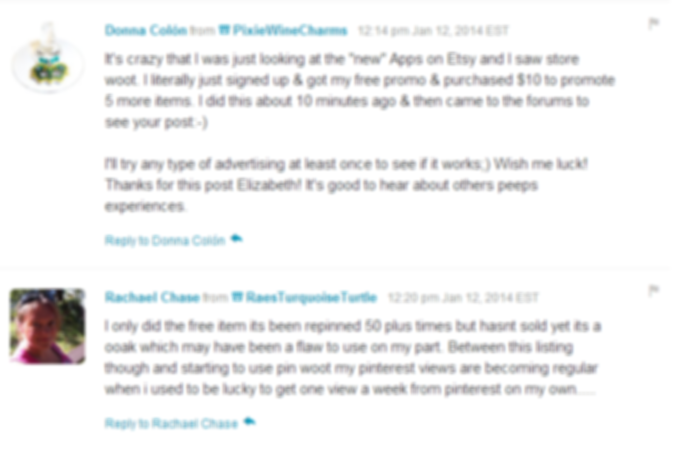 She immediately purchased 10 $ worth of advertising , all because she was happy about the responses by other satisfied Storewoot customers . Thank you Donna ! Willow Cartwright from simplywillow . Willow has been one of our most valued customers , additionally because he provides an insight that is unmatched . He is very pleased with his decision to expand his monthly advertising budget . He has been able to reach people that he thought he could never do , all thanks to Storewoot . He is seriously considering expanding his advertising budget , if the finances permit . We think he will , considering he is getting what he wants . Thank you Willow 🙂 .